Gangotri was 10 when the first boil appeared on her leg — an itchy pustule that soon led to others. Two years later today, both her legs are covered in scabby blisters that continue to spread. Doctors haven't been able to diagnose her condition or cure it. Gangotri is a chirpy, carefree child — she unselfconsciously showed us the skin disease that has so changed her life. 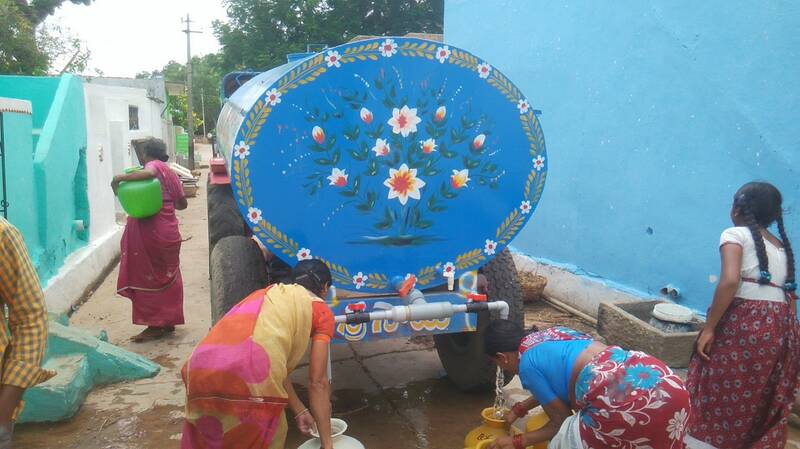 However, the mood in her village — Kottala in Kadapa district, Andhra Pradesh — is one of anger. Gangotri isn't the only one to suffer from the mysterious ailment, other cases abound, as do other conditions: unheard-of diseases, death of livestock, loss of crops. 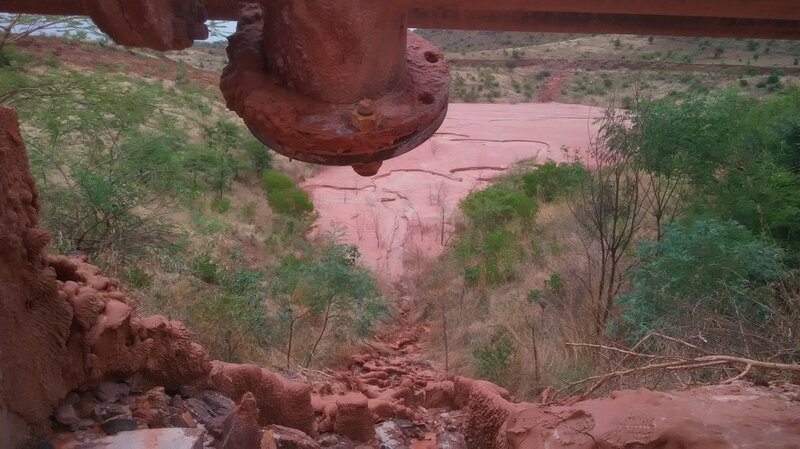 Bad news is in plenty, and residents point to one culprit: the neighbouring Tummalapalle uranium mine. 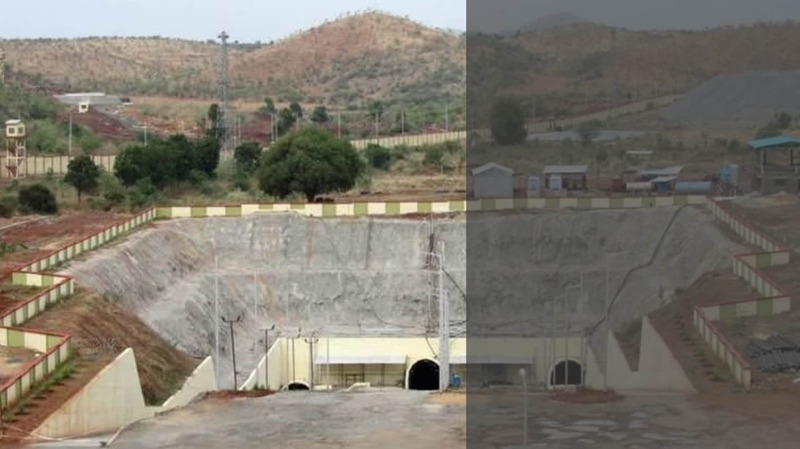 The mine started its operation in 2012 after getting the requisite environmental clearance in 2006; the uranium ore in the Kadapa Basin is the largest reserve in the country. 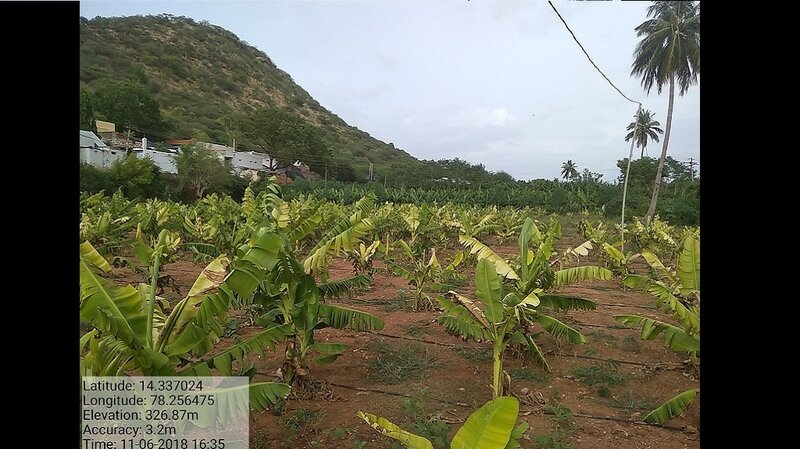 The neighbouring villages of Tummalapalle, Mabbuchintalapalle, Bumayigaripalle and Rachakuntapalle of Velpula and Medipentla Mandals and 60 hectares in Kottala village of Vemula Mandal were acquired by Uranium Corporation of India Limited (a government enterprise) for 'tailing disposal' — these are the areas where waterborne refuse material is pumped into a body known as a tailing pond. This is where the radioactive mining waste has been dumped for the past six years. 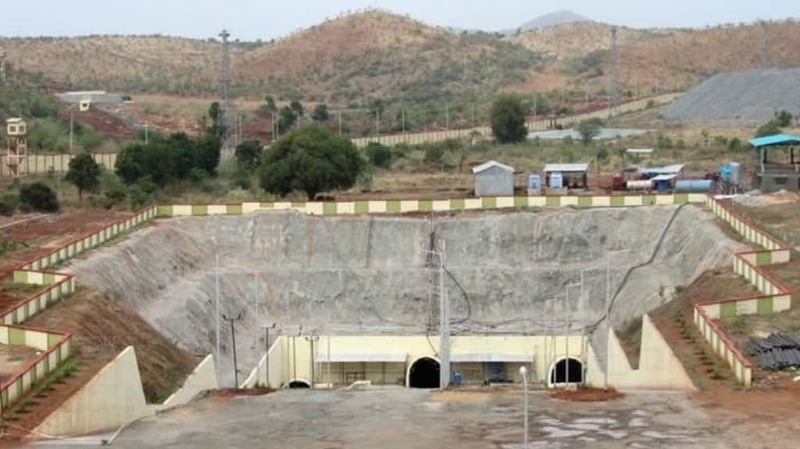 The Tummalapalle project, consisting of an underground mine and processing unit, processes 2,350 tonnes of ore per day (according to a letter sent to the Uranium Corporation of India by the Andhra Pradesh Pollution Control Board). Only 1,305 grams of uranium can be extracted out of the 2,350 tonnes and the rest becomes radioactive waste which is dumped into the tailing pond. It’s been six years since the plant was commissioned, in April 2012. So if we do the math, then till today the plant has dumped some 51,46,500 tonnes (that's 5,14,65,00,000 kg) of radioactive waste into the tailing pond. The remnants of the mining process are stored in the form of a semi-solid slurry, pumped to the pond located six km away from the unit. This slurry contains thorium and radium, which are common components of the leached material and airborne dust from uranium ore tailings and waste piles. They pose a serious health hazard if inhaled or ingested. When we visited the tailing pond, we noted that neither is the area cordoned off, nor does it have restricted entry. The locals with their cattle frequent the area for grazing and other such activities, almost as if it is a normal thoroughfare. Global safety protocol dictates that all tailing ponds be lined with bentonite clay and polyethene to avoid polluting ground water. 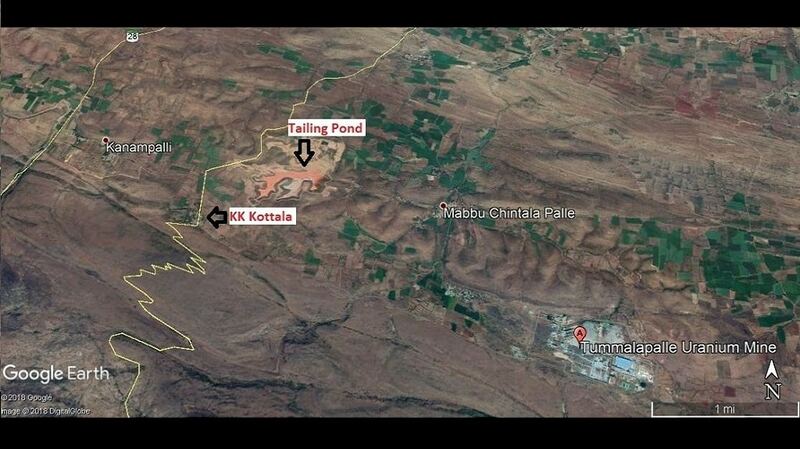 But the tailing pond at Tummalapalle is unlined and the radioactive slurry has found its way into all the neighbouring water bodies. It has affected everything in its wake, from livestock to crops and has started to show its effects on the people as well. The ground water in surrounding villages has become contaminated by uranium and other heavy metals according to a Centre for Materials for Electronics Technology (C-MET) report. 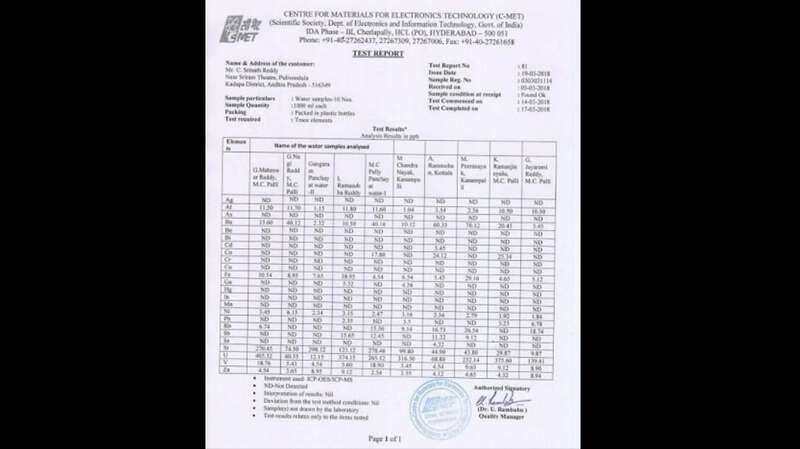 This test was carried out at the behest of YS Avinash Reddy (Member of Parliament elected from Kadapa ) after having received complaints from the locals about the apparent water contamination. In KK Kottala, Mabuchintalapalle and Kanampalli, as soon as people found out we were there to talk about the mine, they started pouring in with complaints. Most of these were about chronic skin problems which doctors had been unable to cure, uniformly present in people of all ages since all of them still use the contaminated groundwater for cooking, washing, bathing etc. They showed us their limbs covered in itchy black scabs. A similar pattern of skin problems was seen in the livestock as well. Karthik, a nine-year-old from KK Kottala, has been suffering from skin problems for the past few years. He constantly itches his body, pain visible on his young face. His right thigh had finally healed after years of medication. But the disease has now reappeared on his left hand and is spreading again. The rashes are just the first strike. Thorium and radium present in mine tailings which have contaminated the water sources, have been shown to lead to a higher risk of cancer (eg. cancer of the bone). Uranium, which is a radioactive element, has a half life of 2,40,000 years and emits radiation for thousands of years. Uranium radiation has the ability to damage human DNA. A team comprising members of NAPM (National Alliance of People’s Movements) and HRF (Human Rights Watch) measured radiation at different places in and around the tailing pond on 11 June 2018, as part of their study of the impact of the mine. The reading were recorded using a Radiation Dosimeter. At the tailing pond, the reading was as high as 0.80-0.90 µSv Microsievert/hour (a measure of the amount of radiation that a person is exposed to during one hour in the specific area). 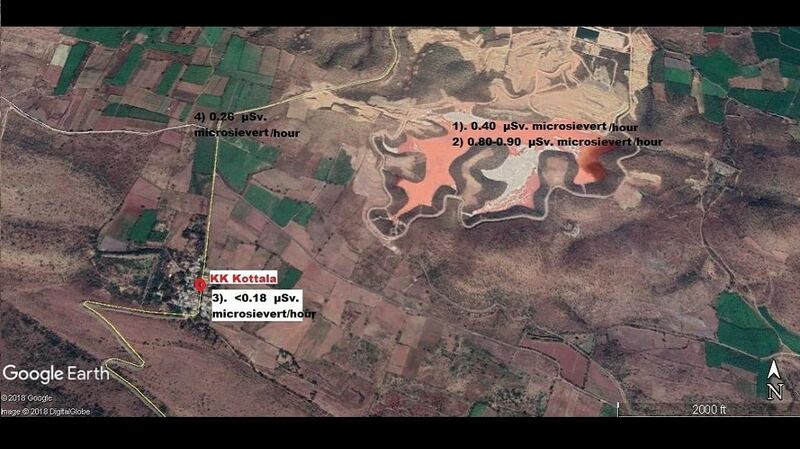 And at a farm in Kanampalli, it was found to be 0.26 µSv Microsievert/hour. The maximum permissible limit is set at 0.24 µSv Microsievert/hour by internationally accepted standards on background radiation. Chandra Nayak’s farm was once flourishing but the past few years have been bleak. When we visited, the farm only had droopy plantains trees with blackened, shrivelled branches to show. The death of the cattle in the affected villages made us recount the words of Ghansham Birulee of Jharkhandi Organisation Against Radiation. Birulee was among the first people to witness the effects of uranium mining in Jaduguda in Jharkhand. 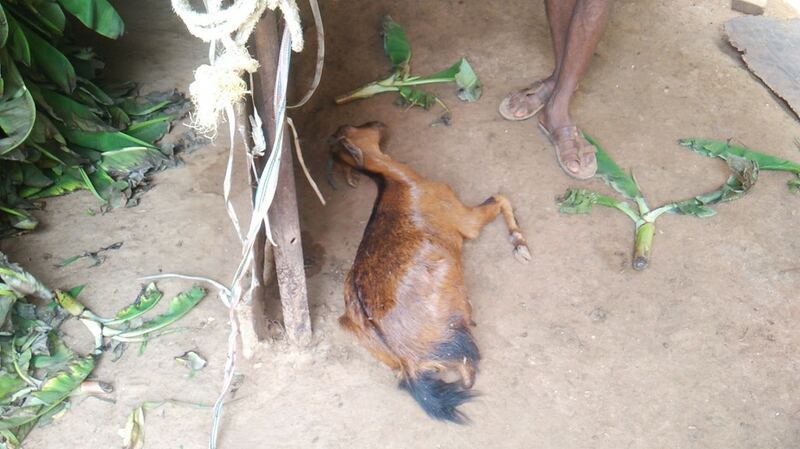 “The animals started leaving Jaduguda area immediately after the mining started... They must have sensed the radiation earlier than the humans,” Birulee had said. Fearing that the other goats will also fall sick and die, Bhaskar sold the rest at the first price he could get, managing to secure only a fraction of the normal rate. Ramanjanelu, who also reared goats for a living, stated that about 30 adult goats and 40 kids (the young goats) died due to similar illnesses, pushing him to the brink of bankruptcy. His losses amounted to almost Rs 2 lakh. Manasa from KK Kottala sold milk for a living and has fallen on tough times now. “The milk production in buffaloes has reduced from 2 litres per day in 2016 to just close to one litre daily now, even if the animal has a new calf.” When asked about where the grazing grounds for buffaloes were, she pointed towards a piece of land on the edge of the tailing pond. Everywhere we went, we were met with hapless farmers who had similar stories to tell. Oodanaagi Reddy, 60, from Mabuchintalapalle village, has one acre of land, and it has been his family's only source of income for generations. A few years ago, the soil he had tilled for decades suddenly turned white. “I have never seen land turning white before. This is all due to the uranium mine. I would get 25 to 35 tonnes of banana as output with profits of up to Rs 3 lakhs. But now everything is gone. 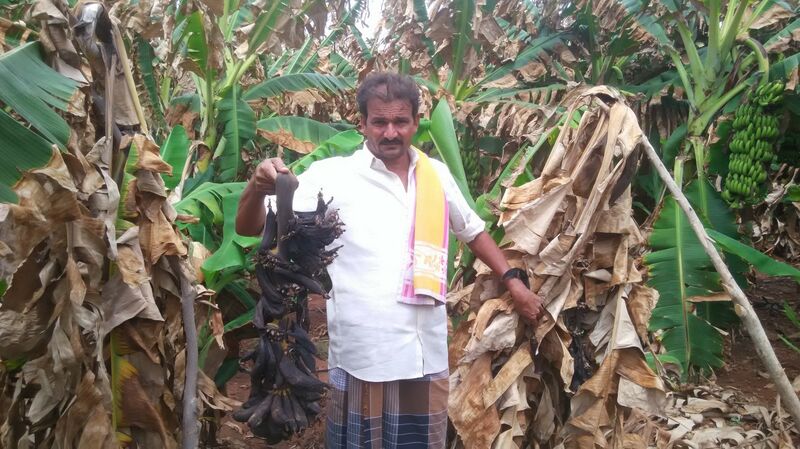 I borrowed money from a private money lender at an interest of 18 percent per annum and I have nothing to pay him back with," Reddy said, tearing up as he showed us his failed crop. Across those villages where banana is the chief crop, we were shown stunted trees with shrivelled fruit. Agriculture officers have confirmed that the smaller roots that absorb minerals and water have not grown properly leading to the stunted growth of the plant itself. “We have been growing bananas for three decades now and we never had any problem. What is suddenly affecting the roots now, since the past year?” asks Reddy. The agriculture officers have no answers to offer. Kannumpalle-based farmer Chandra Naik asserts that the destruction of his crops is due to the mine alone. The loss of his crop was further exacerbated by the Rs 4 lakh he spent digging borewells, only to find that the groundwater had also gone down. The radiation measured at his farm was 0.26 µSv. Microsievert/hour — higher than the maximum permissible limit. Falling groundwater levels were also reported by Raghavendra Reddy, the sarpanch of Bhumayagaripalle. “We used to find water at a depth 100 feet. But nowadays we have to dig up to 1,500 to 2,000 feet to find any water,” he said. The sarpanch has dug some 54 borewells over his 24 acres of land. In Naik’s field, the stalks of the banana plants oozed a strange red liquid. He is now faced with the difficult task of cutting down the fruits of his labour as there are no buyers for his yield. When village after village started complaining, the issue was taken to the Andhra Pradesh Pollution Control Board — Kurnool zonal office (APPCBK) by local public representatives. Responding to the complaint, APPCBK has issued a show cause notice to UCIL on 23 March 2018, stating “whereas you have not lined the tailing pond, in spite of specific conditions stipulated by in EC (Environmental Clearance), CFE (Consent For Establishment) and CFO (Consent For Operation) orders, and thereby violated the conditions of EC, CFE and CFO orders [sic]”. The notice further said: "...the water samples collected from the surrounding bore wells M/s. UCIL and Hon’ble Member Parliament, Kadapa Parliamentary constituency, the value of uranium are exceeding the standards [sic]”, ordering UCIL to respond as to why APPCBK should not take action according to the Water Act 1974. To this UCIL, replied on 2 April 2018, blaming the natural uranium content of the land for the groundwater pollution. UCIL also claimed that it had laid the clay lining for the tailing pond according to AERB, but it failed to mention the type of clay that was used. UCIL has also stated that the uranium mining in Jharkhand and Andhra Pradesh uses innovative ways of mining “with improved measures towards the environment” which had got huge public support. UCIL also claimed that the allegations against it were being voiced by anti-nuclear NGOs with an agenda. Why have all the problems started right after the establishment of uranium mining? Back to the APPCBK-UCIL correspondence, the former responded on 19 April 2018 with a letter asking UCIL to furnish proof that the tailing pond had been lined. It also said AERB and APPCB are different bodies, and both their rules must be upheld. It also categorically stated that UCIL’s claims of not polluting groundwater were false: uranium values were 1 to 7 ppb in the water samples collected in Mabbuchintalapalle in 2013, whereas uranium values ranged from 690 to 4,000 ppb (against the standard of 60 ppb) when the borewells in the surrounding villages were more recently monitored. The APPCBK has constituted a committee to investigate and report on Tummalapalle uranium mining. The committee visited the affected villages in the last week of June 2018; its findings are yet to be made public. Furthermore, UCIL has not made any attempt to increase the green cover around the tailing pond as a means to curb the spread of dry radioactive particles through the air, as stipulated in the Terms Of Reference. Instead, what can be seen is that plants have been allowed to grow inside and along the side walls of the tailing pond, which would make the soil more porous and lead to greater seepage from the already unlined tailing pond. UCIL is known for only ever speaking up to defend itself from the questions raised by the affected villagers. The public hearings at the UCIL office in Tummalapalle was conducted under extreme pressure, and even then, no outsider was allowed. In a meeting held in April 2018, UCIL brought Bhabha Atomic Research Centre (BARC) officials as consultants to defend them, but would not allow Dr Babu Rao (who retired as principal scientist from IICT) to attend the public hearing as a representative of the common people. Dr Rao was unlawfully detained at Vemula Police Station, and only after the villagers protested, was he allowed to participate in the discussion. Villagers have demanded that UCIL should conduct its public hearings in neutral places and not in its offices. They have further asked that the proceedings be conducted in a manner and language that they can clearly follow. Rajnish Rai, a 1992-batch IPS officer who served as the central vigilance officer for UCIL in 2014, had come out with a report last year that pointed to “several procedural and management failures in the implementation of the Tummalapalle Project” which allegedly cost the government Rs 970 crore in losses. He pointed to various cases of corruption and mismanagement within UCIL, and also stated incidents such as the decommissioning of the mines at Mosabani and Rakha, which was done without approval from the AERB and without adequate safeguards. In the case of the mismanagement of the Tummalapalle mine, Rai recommended a performance audit by “CAG to independently, objectively and reliably examine whether Tummalapalle Project is being executed and/or functioning in accordance with the principles of economy, efficiency and effectiveness”. Due to mounting pressure from activists and locals, a public meeting was conducted on 13 July between the Kadapa district collector C Hari Kiran and UCIL officials, to address complaints against the latter. T Rajendra Reddy of the Kurnool zonal office of APPCB confirmed to us that a committee had been set up, consisting of nuclear physicists and other eminent scholars, to look into the reality of the Tummalapalle mine and its impact and to guide necessary action against UCIL. Reddy also mentioned the findings that pointed to increased uranium content in the water and how this had been passed off as being due to natural geological formations by UCIL, in its reply to the APPCB’s show cause notice. UCIL’s inability to furnish the proof that APPCB’s rejoinder sought, has been communicated to higher officials and the committee’s report is now being awaited to decide on further action. We also spoke with a senior medical practitioner from the nearby town of Pulivendula, Dr EC Gangi Reddy, who said that he had noted "an increase in the incidence of skin diseases over the past one-and-a-half years, especially from the villages around the tailing pond". He further added that “the reason for such an increase should be ascertained as soon as possible”. Ashish Birulee, from his many years of experience in the Jaduguda area, told us that being displaced is a major issue for those affected. "Land owners will never be properly or completely compensated. Instead they will be left behind to protest and struggle for what is rightfully theirs,” Birulee says. Jayasree Kakumani, an environmental activist working with Human Rights Forum (HRF), is a well known figure among the people affected by the Tummalapalle project, having worked in the area for many years. One of her long standing demands is that “compensation should be paid to the affected people and mining activities should be stopped until the tailing pond has been properly lined”. If Jaduguda is any indication, UCIL will disappear from the site as soon as the project loses its economic viability. Those who live in the area will be left grappling with the tonnes of radioactive waste left behind. Where will these people go for help? Who should they complain to, about the way their lives have been bartered in the name of development and better economic prospects? Amid the finger-pointing any real solution remains elusive.